To evaluate the efficacy of granulocyte-colony stimulating factor (G-CSF) prophylaxis in preventing chemotherapy-induced febrile neutropenia in the heterogeneous population of adult cancer patients treated in our institution, all adult cancer patients with either a solid tumor or lymphoma who were admitted for chemotherapy in our institution between 1 January 1994 and 31 July 1995 were retrospectively studied. 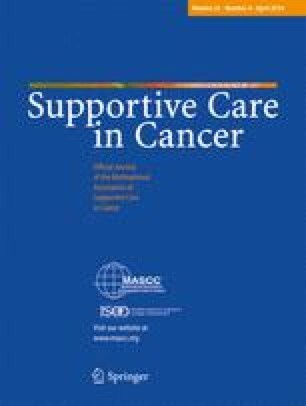 We compared the characteristics of chemotherapy cycles in which G-CSF was given as prophylaxis and of those with no prophylaxis. In all, 1,079 chemotherapy cycles given to 209 patients were analyzed. Prophylaxis with G-CSF was given in 66 cycles (6%). Patients receiving G-CSF were significantly younger and were more likely to have lymphomas. Febrile neutropenia developed in 40 cycles (4%). There was no difference in the rates of febrile neutropenia, infection, hospitalization or mortality between the study groups in general, and cycles administered to patients being treated for lymphomas in particular. The routine use of prophylactic G-CSF in a mixed cancer patient population with a low incidence of febrile neutropenia is not justified and should be reserved for individual patients with a high likelihood of developing febrile neutropenia.